The table gets turned around and it’s the time for the deceived to deceive the real culprit. Making the fake culprit one of their hands, would the real one gets carried away with the lie and falls into the trap? Only time could tell, mixed with how cautious the fake one and how sharp is the real one. 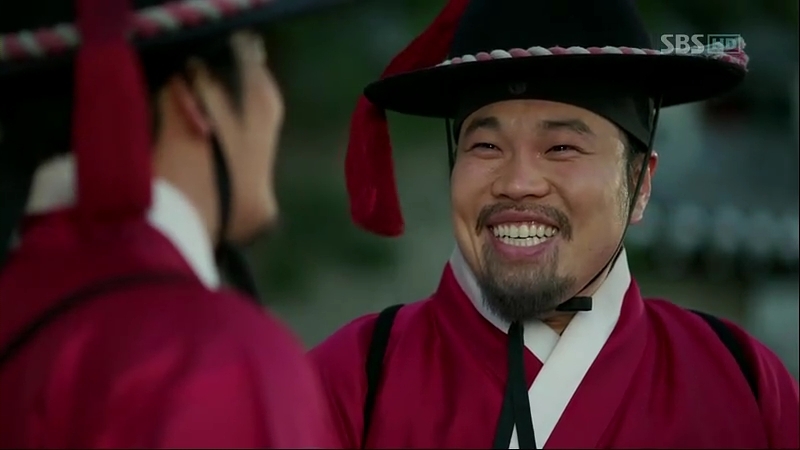 Sejong is happy when So-Yi tells him how easy it was for Chae-Yoon to learn all the alphabets. Prince Gwangpyeong says it’s rather impressive how the letters have the faster effect on him than Sejong’s persuasion, but his father says nothing is wrong, as long he is now here, willing to work for him. 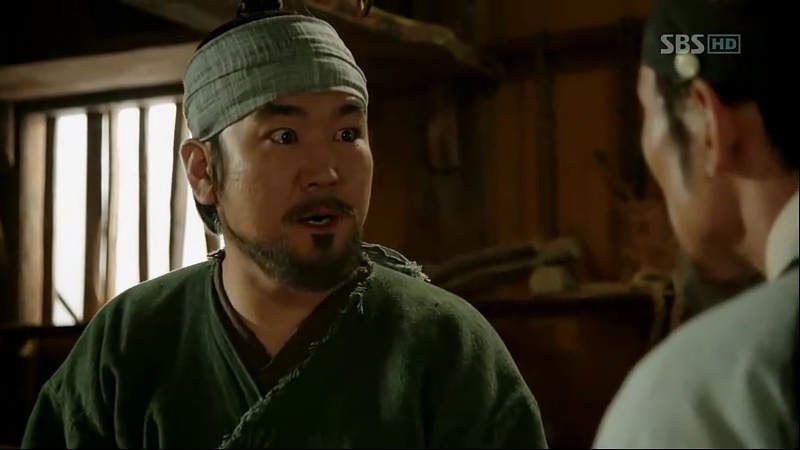 Sejong wants Chae-Yoon to continue being Ddol-Bok, assessing his alphabets and the noblemen from his commoner’s point of view. 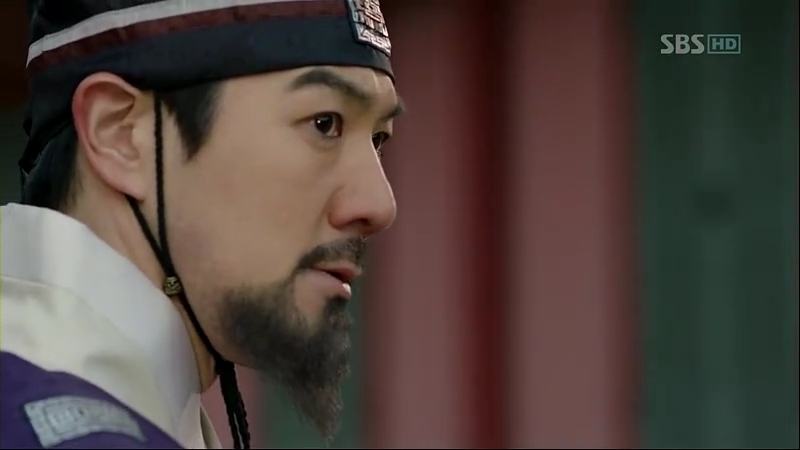 It’s not a hard thing for Chae-Yoon, and quoting So-Yi’s words to him, he wants to see it personally what the noblemen are going to do to the common people like them. He also has an idea on how to find Mil-Bon. The cloth with the Hangul letters are brought back to Ki-Joon by Pyeong , while he’s explaining the details about what happened earlier. Ki-Joon decides to purse Chae-Yoon, curious on what he’s planning to do to the prince. He is puzzled why Han keeps staring at the alphabets and Han says the shapes are quite odd. 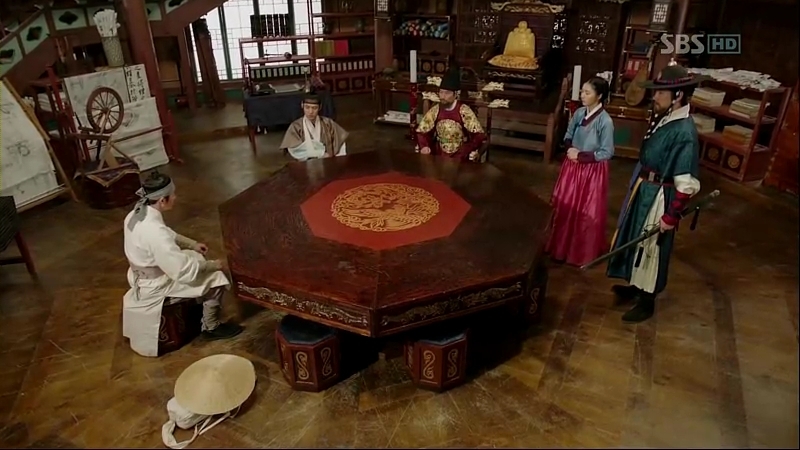 Chae-Yoon begins to describe his idea to Sejong and others. He plans to make the Mil-Bon believes he has kidnapped Prince Gwangpyeong and telling the prince to hide for the time being, that would surely pique Mil-Bon’s interest on him when he returns to his guard post. He discloses about the suspicious people he thinks are associated with Mil-Bon. Sejong thinks it’s better if they don’t go straight to catch the suspects. It’ll just make their higher ups go in hiding, making it harder for them to catch the leader, Jeong Ki-Joon. Chae-Yoon promises to bring Jeong Ki-Joon to Sejong and in return, he asks for Sejong to grant a wish.He bows down to him and genuinely smiles when the king agrees. Moo Hyul is still curious about the masked man’s identity. Chae-Yoon approaches him, chasing off what he’s thinking earlier. He comes clean with Chae-Yoon: he won’t be in good terms with him just because he’s now on Sejong’s side, but he’ll try his best to help him in the investigation. Moo Hyul also advises Chae-Yoon to be aware of the masked man assassin, the one that also hurt Cho-Tak and Park Po before killing a Mil-Bon member in their custody. 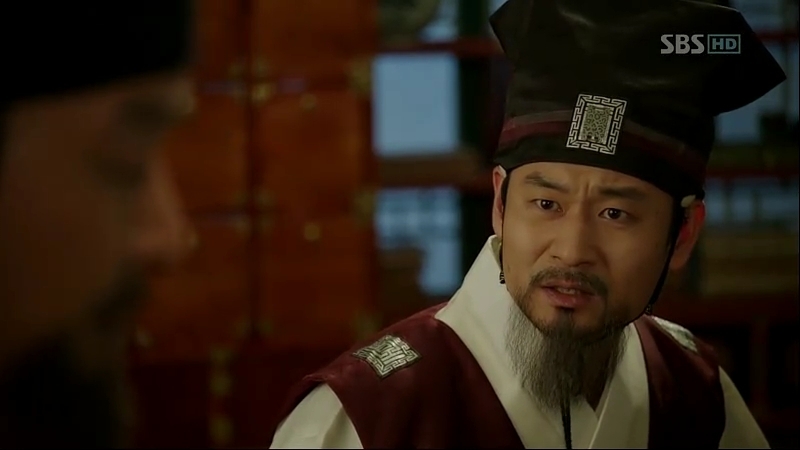 Scholar Choi voices out his concern about the new writing system to Scholar Lee Soon-Ji. He decides to call back Paeng-Nyeon and Sam-Moon to the palace in order for him to learn a bit about the alphabets and find out more about the system. Scholar Shim and Minister Jang is discussing about the reason why Chae-Yoon kidnapped the prince, also the persistence of both Jong Ki-Joon and Sejong to win against each other. 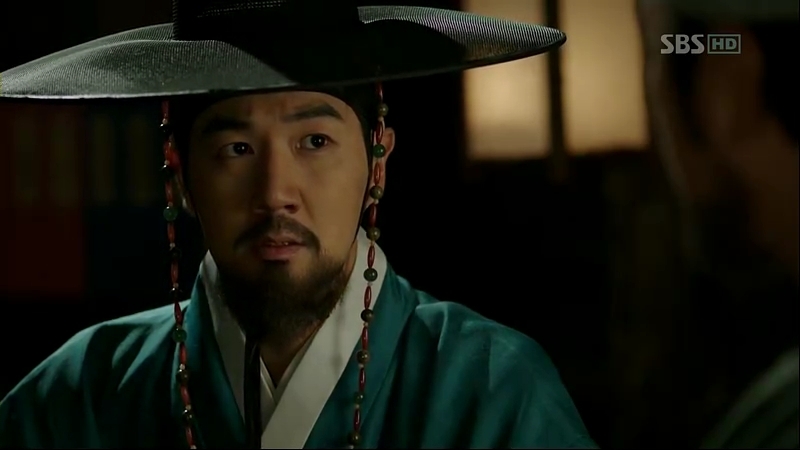 Scholar Shim’s struck with surprise when Chae-Yoon appears in front of them, looking all normal in his guard outfit. 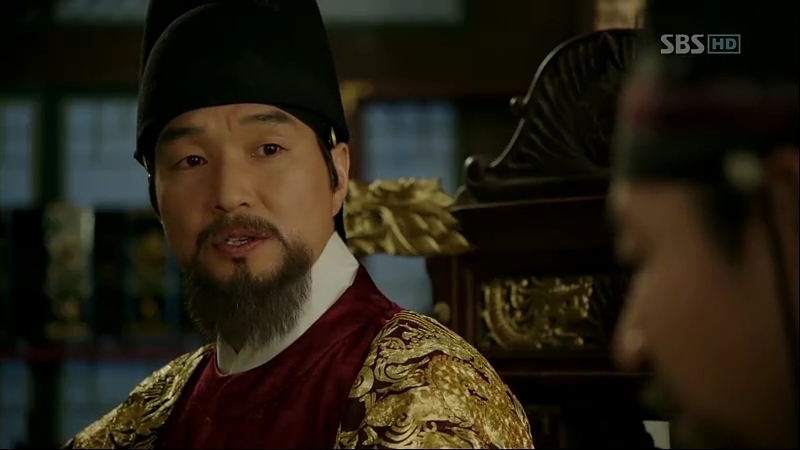 He tells Minister Jang to check whether the prince has returned to the palace. 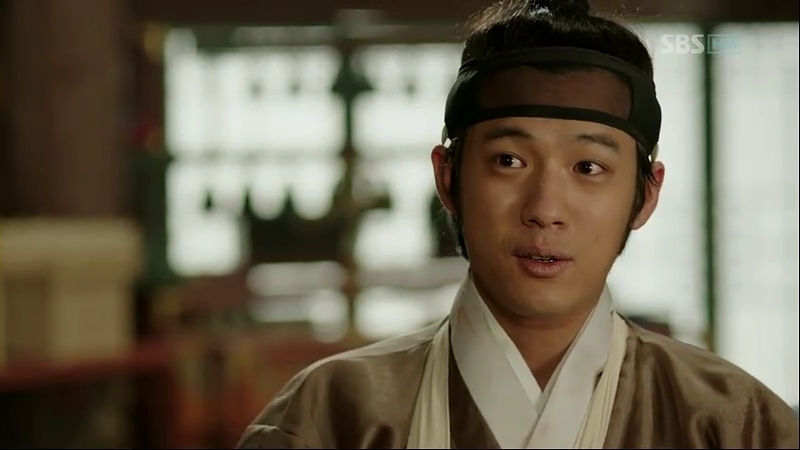 In front of the palace gate, loner Park Po is mumbling to himself about Chae-Yoon’s sudden leave. He is quite upset to have him disappearing just like that, without thinking about him who cares for him (awww). Without him realizing, Chae-Yoon is beside him, listening to his every ramble before calling him. Park Po is surprised, but he’s also glad his friend decides to stay for good this time. He wipes his happy tears, while Chae-Yoon smiles when he thinks about his wish to Sejong. Scholar Shim reports what happened during the discussion and the news about Chae-Yoon’s return to the palace is quite a surprise for Ki-Joon. 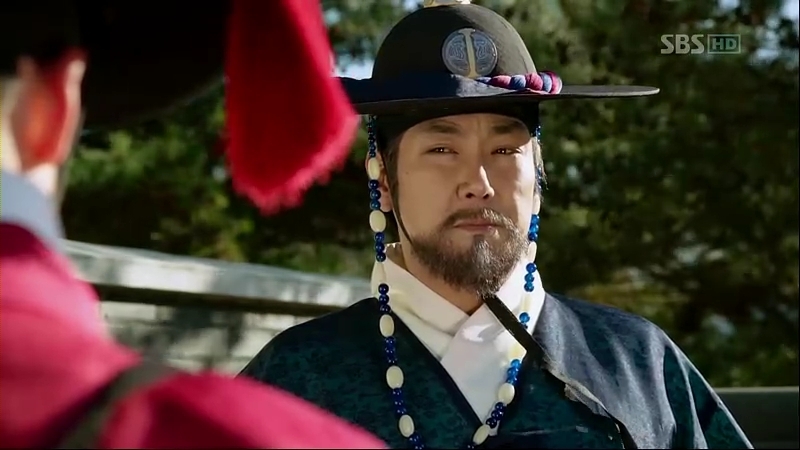 They are speculating whether thhe prince has already been killed by Chae-Yoon, and now he’s going to pursue his next target: Sejong. Ki-Joon realizes that Chae-Yoon and Mil-Bon’s target is the same this time. He wants So-Yi’s return to be checked before making any move. At the tavern in Banchon, Chae-Yoon treats Cho-Tak and their neighbours for a meal. He’s taken aback when the little girl says one of the rumours about him disappearing was because he ran off with a girl. He laughs it off, and the topic about Pyeong comes out. When Cho-Tak says’ Yoon Pyeong’s name, Chae-Yoon remembers something. He sees Dam-Daek passing by in front of them, and realizes that she once called for Pyeong’s name. One clue is in his hand. While Sejong is grinning from ear to ear about the recent development, Minister Jeong isn’t comfortable with the officials that might attack them anytime soon, moreover after Sejong discloses his secret project, making the sudden publish of the system now impossible. 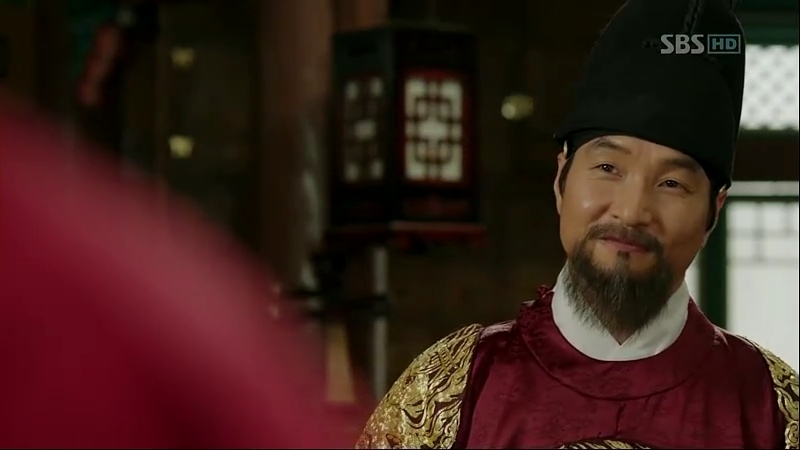 They involve in a playful argument, and Sejong comes clean about his plan to counter attack them. He wants to use words to win over them as he believes words are stronger than swords. If words are to be equally strong to swords practically, Moo Hyul assumes Sejong would be the strongest one in the world. Sejong walks into the usual place for discussion, but there’s only the Prime Minister, Minister Lee, and Minster Jo inside the room. The other officials, including the scholars, are boycotting the discussion, thus leaving the room almost empty. 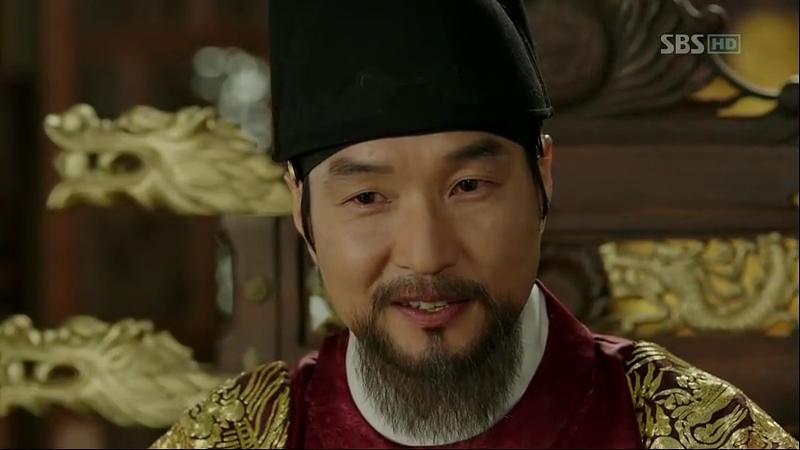 When Minister Jo urges him about saving Prince Gwangpyeong, he snaps and warns him not to mention it anymore. He leaves the ministers wondering why he’s so persistent in publishing the writing system. In front of the gate, the scholars have joined Scholar Hye Gang, pleading Sejong not to continue with his project. Sejong appears in front of them, offering an open discussion about the pros and cons of the new writing system. Scholar Hye Gang starts with pointing the uniqueness of the Chinese writing system with its ability to directly link it to the Confucius teachings. Sejong admits that his writing can’t do that, but he presents his argument. He aims for the commoners to be able to read and write, so that they’ll be able to complaint to him, thus as a king, Sejong would obey one of the major Confucius teachings, which is to hear what his people has to say to him. He further answers all the arguments thrown at him by the officials and Jip-Hyun Jeon scholars around the palace and they can’t go against his sense of logic. He finishes his long day, returning to Gyungsungjeon with aching body. The court ladies enlighten him, cheering him on. 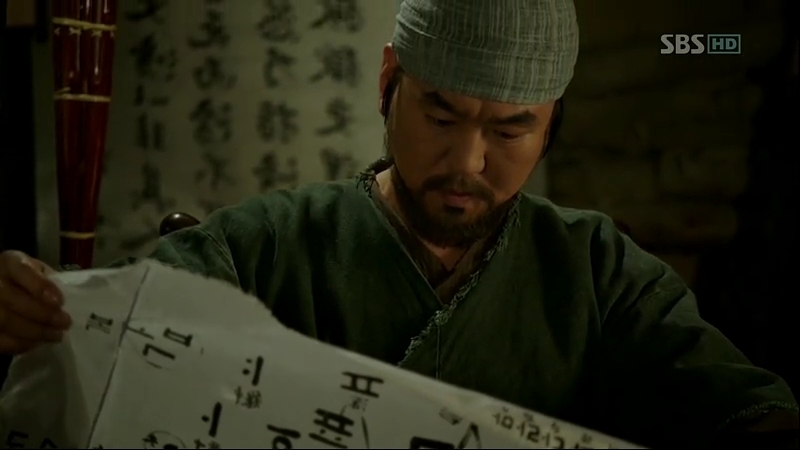 They talk about Scholar Choi, and the scene changes to show Scholar Choi, who’s busy writing his long arguments. Paeng-Nyeon and Sam-Moon return to the hall and meet him, but when they refuse to tell him anything about the new alphabets, he chases them out of his sight. The Mil-Bon people admit they’ll never be able to win over Sejong when it comes to a logic argument. Ki-Joon decides not to stop Sejong from publishing of the writing system because he believes just like the other writing systems, no one would use it and it will be forgotten. He wants them to concentrate more on their main task: to get rid of Jip-Hyun Jeon. 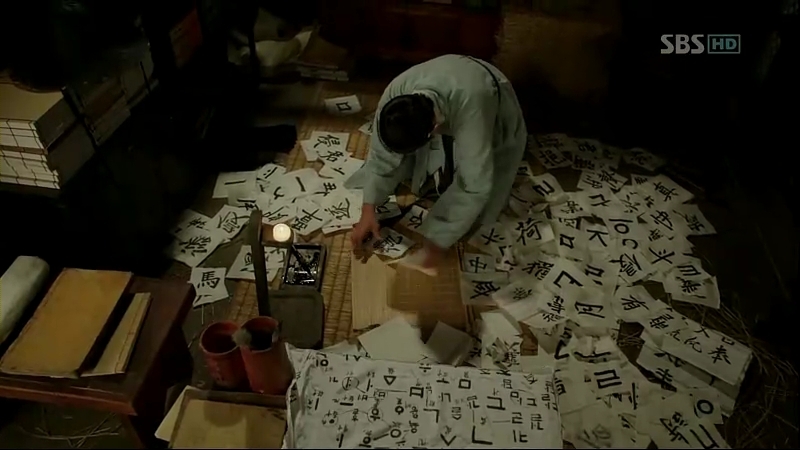 On the other hand, Han is busy studying the alphabets and he finds something. Minister Lee tries to make Scholar Shim one his man by saying that Jeong Ki-Joon would never be able to be a nobleman because he has become a butcher and he’ll just be a leader in the dark. 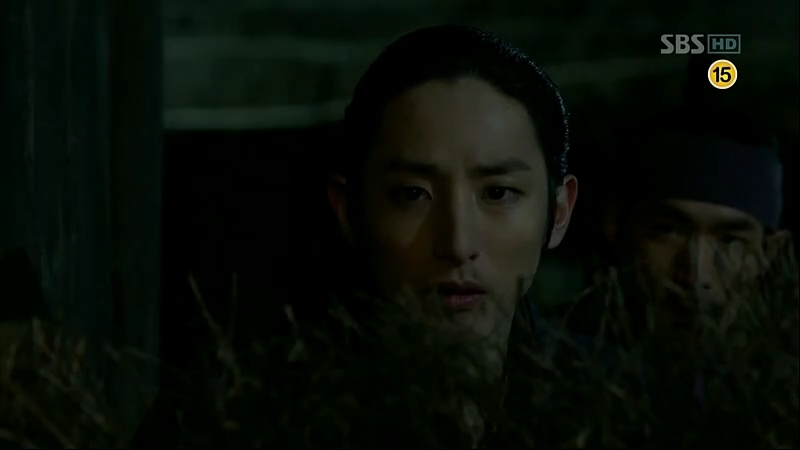 Scholar Shim isn’t happy with his idea and he quickly leaves, ditching the idea of betraying the Root. Minister Lee’s behaviour is already known by Dam-Daek and Ki-Joon based on his nature, but Ki-Joon is not worried about him. 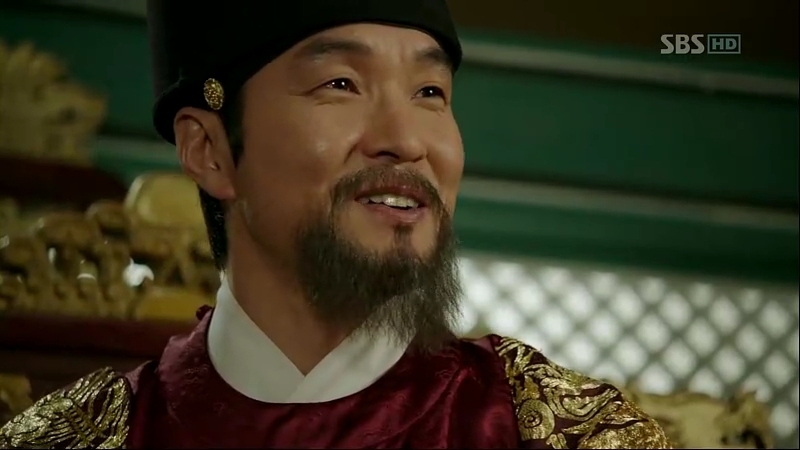 A man comes to report about So-Yi’s return to the palace, raising more questions about Prince Gwangpyeong. Ki-Joon decides it’s the time for Ggeoksoe to meet So-Yi and Dam-Daek to talk to Chae-Yoon in order to find out the real situation. 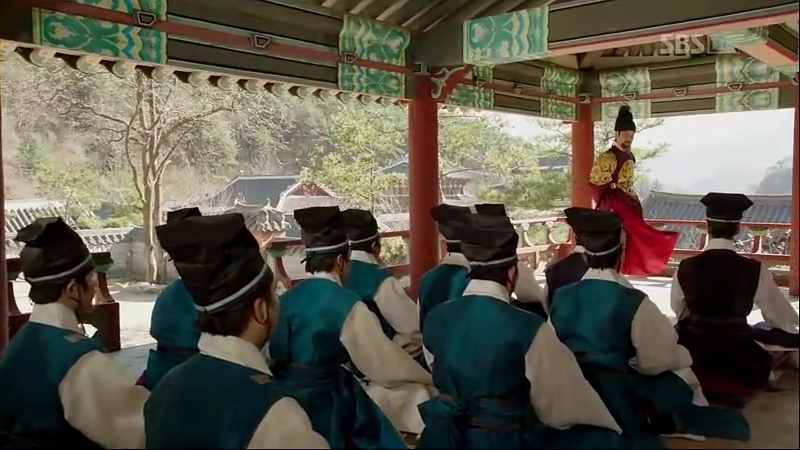 The palace is empty; with the ministers and scholar are all boycotting Sejong’s project. Minister Lee tries to cooperate with Prime Minister to solve the issue and he gladly hears what the Prime Minister has in his mind in order to solve it. They go to meet Sejong and report about the ministers’ absence that day. Minister Lee comes clean about another reason that drives the ministers to be like that: Jip-Hyun Jeon. They provide a negotiation with Sejong: if he’s willing to abolish Jip-Hyun Jeon, they’ll persuade the officials to agree with him. Sejong is angry, but they want him to consider it. Sejong returns to Gyungsungjeon and tells Minister Jeong that he has given his approval to Prime Minister. Sejong is confident with his decision as it will give him the opportunity to publish the alphabets and prove those who think it’d fail wrong. He admits Jip-Hyun Jeon was his defence against Taejong and one of his methods to gather his own people. However, he doesn’t plan to let it go off easily and plans to make a department specially to handle his alphabets in return of closing the hall. Prime Minister and Minister Lee return to their office, gladly report that Sejong agreed to close Jip-Hyun Jeon. They are anticipating tomorrow’s meeting, where Sejong will announce it officially. Sejong further explains his dream department’s job and in order to make his people use it, he’ll make it the official language for the court’s officials and one of the components in the royal examination. Minister Lee informs Scholar Shim about the development and he’s so confident Sejong will agree to his suggestion. However, he still has his suspicion around Prime Minister and doesn’t fully trust him. He wants Scholar Shim to control the scholars once the news about Jip-Hyun Jeon’s abolishment news breaks loose, especially Scholar Choi, as he’s the one who’s against the new writing the most. Scholar Shim meets up with Scholar Choi. He’s so sure the alphabets won’t be used by anyone although it is successfully published, but Scholar Choi manages to shakes his confidence. 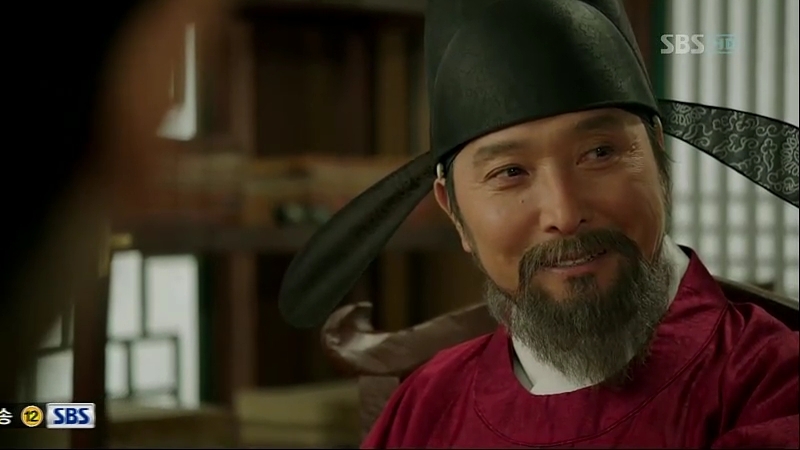 As Sejong is one brilliant king, Scholar Choi doesn’t think he’ll let his 13 years of work goes into a waste and he’s never failed to do something. He assumes the alphabets must be something great, and they get published, the Chinese writing system they are using right now might be abandoned. Scholar Shim thinks about it, and wonders whether it is possible or not to have a world where everyone can read. Pyeong and his minions are ready to bring Chae-Yoon to Dam-Daek and they go to his house. 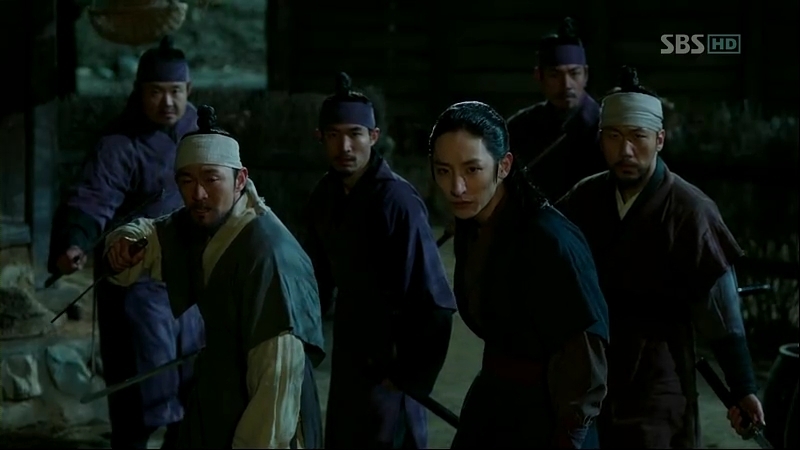 Pyeong warns his men to be careful of their opponent and they enter his house, while at the same time, their target is already at Dam-Daek’ place, his sword right on her neck. They find his house to be empty and wonder where he has gone to. At first, when Chae-Yoon accuses her of being a Mil-Bon, she hesitates and tries to deny it, but soon she admits it. 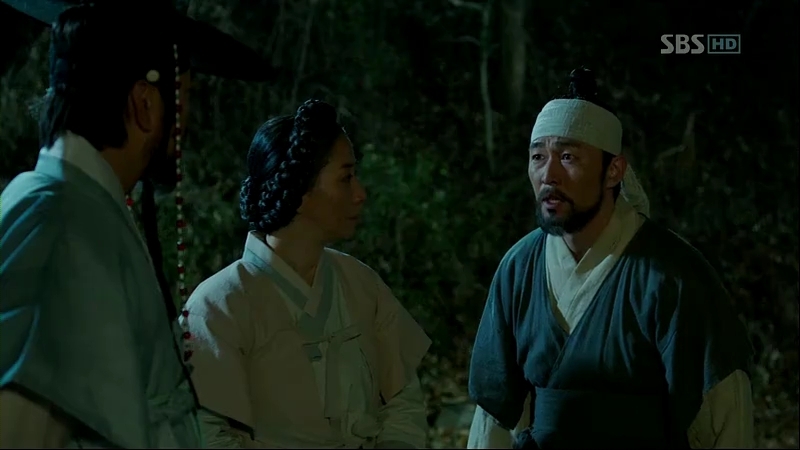 Chae-Yoon tells her, because of Mil-Bon, he had to cancel his plan to run with So-Yi, thus he had to kill Prince Gwangpyeong. She is shocked to hear that, but he’s more shocked when she tells him that she knows his plan to assassinate the king. At the same time, So-Yi is approached by someone and she knows him: Ggeoksoe ajusshi. Chae-Yoon is still persistent in getting Jeong Ki-Joon and forces Dam-Daek to bring him to the Root. Pyeong’s team has arrived at Dam-Dek’s house, and Chae-Yoon’s screeching angry scream confirms that he’s inside. He then goes out of the house with Dam-Daek as his hostage. She offers to give a chance to give Sejong a real pain rather than killing him directly and wants to work together with him as their target is the same: the king. She proves her faith in him by ordering Pyeong to leave. He agrees, but he only wishes for them to help each other. 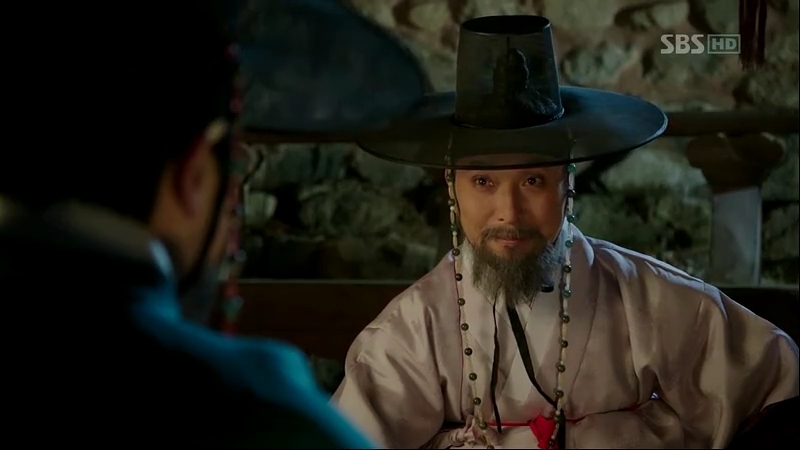 Dam-Daek reports it to Ki-Joon, and he compares what Chae-Yoon said to her with what So-Yi told Ggeoksoe: he killed the prince, but she didn’t tell the king in order to protect him, while he’s now focusing on killing Sejong. Ki-Joon is now believes what Chae-Yoon said was true as it matches perfectly with So-Yi’s story. Chae-Yoon explains how he knew So-Yi would be approached by Ggeoksoe, thus giving them the opportunity to prepare with matching stories from their sides. So-Yi says she might be planning to kill Sejong if she wasn’t saved by the queen. He sighs, telling her that commoners like them have their fate on the people they’re working for. Chae-Yoon hesitates to give his answer when So-Yi asks his wish that he’s going to ask from Sejong and tells her it’s nothing much. After giving it a thought, Ki-Joon decides it’s good to have him on their side and Dam-Daek is to be on good terms with Chae-Yoon. Han is not there, but he’s busy teaching the alphabets to the little girl named Yoon-Ji and the messy masked man. The next day, Chae-Yoon goes to see Sejong. He asks for a copy of the alphabets as his proof to Mil-Bon to make them believe him, but Sejong doesn’t want to disclose anything yet. He knows how the people would react when they see the alphabets, and if Mil-Bon knows how it looks like, they might try to stop it at any cost. 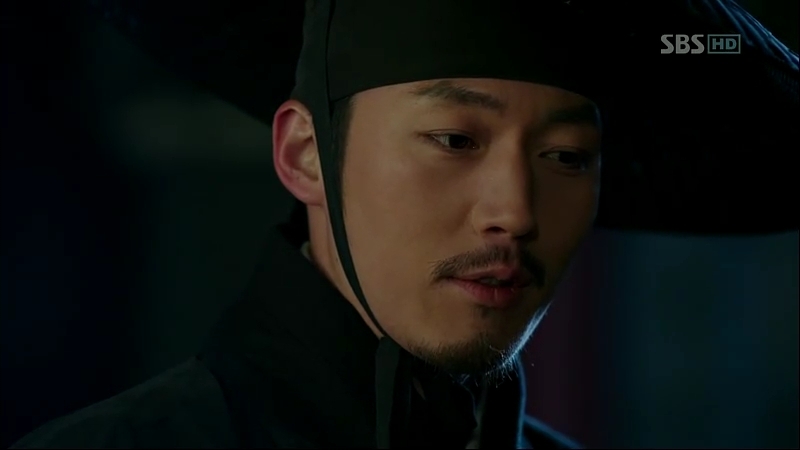 Before he leaves, Sejong asks what makes him full of drive in pursuing Mil-Bon this time. Chae-Yoon answers him, saying that he wants to do what exactly Sejong said: to enjoy the life. Sejong asks him what his wish is, but he just looks at the floor. Before Sejong could guess it, Moo Hyul comes in and Sejong promises to make it work before leaving the room. Scholar Shim can’t keep his thought to himself and decides to meet Ki-Joon. His thoughts about the writing system bugs him, and giving Sejong the opportunity to publish the letters might lead to something they don’t predict to happen. Suddenly, Han barges in, eager to show Jeong Ki-Joon something he found. Han finally finds out how the alphabets work. They aren’t the same as Chinese characters, but basically phonetics letters. According to him, the consonants and vowels could write any kind of sounds. He also finds out the real meaning behind the characters ‘Goon Gu Mang Gi’- something that might be pronounced as Mil-Bon. Minister Lee is very confident Sejong will close down the hall. He laughs, saying that his time to shine has finally come. Minister Jang looks at him, puzzled. The day has come. Sejong is ready to take his action and wants Minister Jeong to get ready for instant publish. Han brings Ki-Joon to see Yeon-Du and the messy man. They are able to write their names and complete sentences in only two days after learning it. Ki-Joon is surprised, but he realizes that a world where everyone is literate can be a threat to the power of the noblemen. It’s their priority to block the new letters. Jeong Ki-Joon urges for the deal between Minister Lee and Sejong to be cancelled, while Sejong is looking forward to it. Now you know how good they are, huh? It’s good to see the calm Jeong Ki-Joon finally bursts out of his safe bubble and realizes that his opponent this time isn’t the Yi Do he once knew. He’s now shaken with the simplicity of the alphabets, and just like Sejong predicted, he’ll take any measure to stop the alphabets from being publicized. Well, it’s now probably the last hurdle Sejong needs to face before he can show the world his brilliant work. 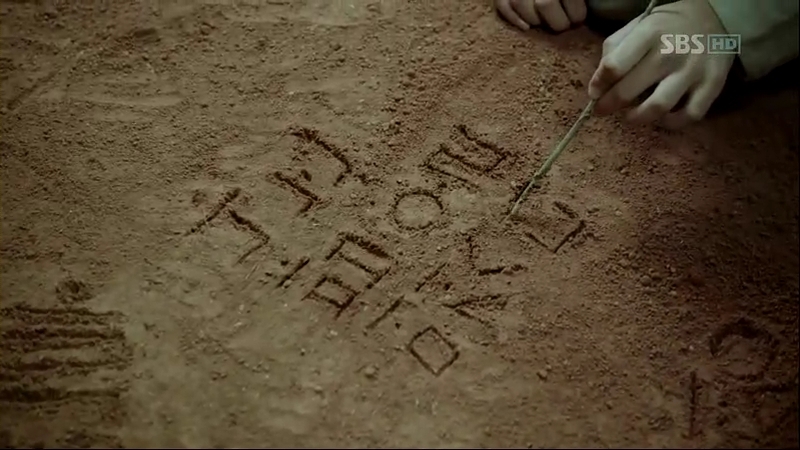 However, I’m quite sad because Scholar Choi is so against the Hangul letters. He’s one of the leaders in Jip-Hyun Jeon, so I’m kind of hoping he’d support it, but according to the history itself, he even resigned because of it. Ah…at least we have Minister Jeong and the two young scholars behind Sejong to support him.. Happy to see them back, even for a brief second. Actually, my focus in this episode is..
…the finally-looking-earnestly-happy Chae-Yoon. Fuh, that’s long adjective. He’ll look sort of dreamy when he’s talking or thinking about his wish, and from his reaction when So-Yi asked him about it, I am thinking it has to do with her. Awww…it’s just plain cute how he’s so happy about it, the first time I’ve seen him like this since the time when he imagines his future with So-Yi. Ohhh…I want a happy ending for him! 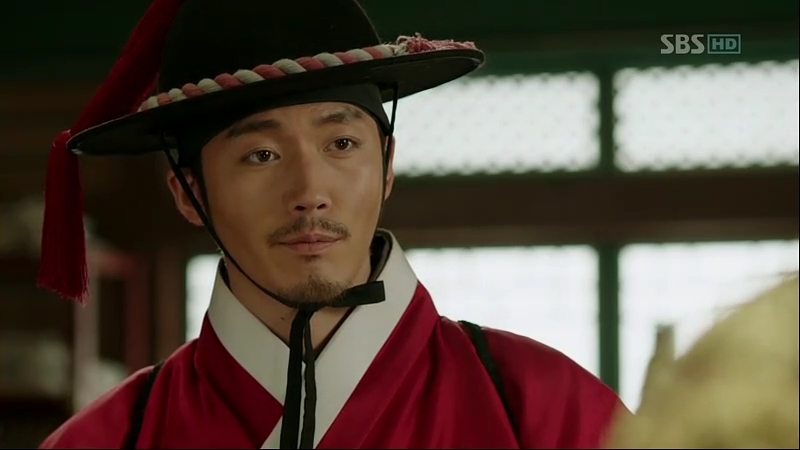 No things like killing the mighty Jang Hyuk again! I’ll resent you if you do that, show!